THE CLOUDS HAVE unzipped their burden onto the earth, but now the rain has stopped and the roads are soggy. The irrigation channels in the pastures overflow with muck. Bayonets of bright green grass peep through the bloated soil. In the distance, the tailpipe of a tractor puffs a scarf of smoke around the edge of the field. Under a patch of trees nearby, a small campfire crackles inside the remains of a clothes dryer. “Who needs biscuits?” a young man with steely eyes says to a group of roughly a dozen men gathered around the fire. Some are crouching, others kneeling. Some stand and stretch. Eggs boil in a small kettle. Tiny cups of tea pass between big men. It is about 10 in the morning and the sun peeks through the haze. The fire smolders, and one man walks deeper into the grove. The sound of wood snapping comes from where the man disappeared. He returns and feeds twigs to the fire. “Hopefully we will finish early today,” mutters Hasan Mohammad. Like most of the men, he is dressed in sturdy navy work clothes and, like most of the men, his speech is muffled by a baby-blue surgical face mask. At his feet several white body bags lie in a row on the dirt path abutting the green grass. The field beyond them is a chaos of choppy heaps of earth that indicate makeshift graves. Starting in January 2014, Raqqa was the de facto capital of the Islamic State. A Kurdish city in northeastern Syria, Raqqa hugs the banks of Euphrates River, and it was the site of brutal torture filmed by ISIS for propaganda. The area is where journalists James Foley and Steven Sotloff are rumored to have been beheaded. For years the city’s residents lived under forced Islamic rule. Then, in October 2017, the US-led coalition liberated the city from the militants after months of urban warfare throughout the city’s narrow and circuitous streets. By December 2018 more than 165,000 displaced residents had returned to the shell-pocked city. According to US Central Command, air strikes here killed some 1,200 civilians and countless more ISIS fighters. Many of the dead were hastily buried. Some graves hold a single body; one held close to 1,500. 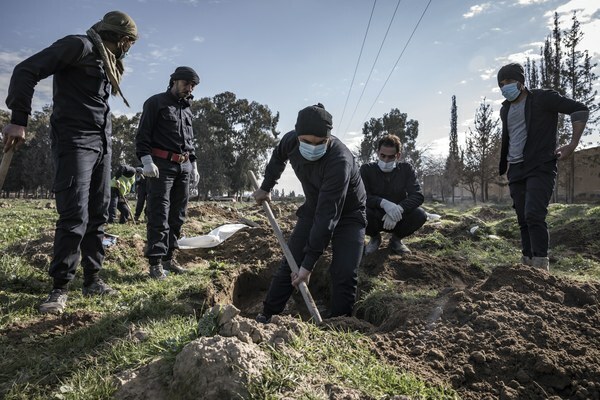 They stipple Raqqa and the surrounding countryside, and as former residents return to their damaged and destroyed homes, the city government is working to exhume and identify the bodies. The men around this fire have been hired as body pullers, and they have been doing this work for more than a year. Today they’ll work from 8 in the morning until 3 in the afternoon—the winter sun sets early. Sometimes the remains are released to relatives who might be able to identify their family member based on a tooth or a sneaker. If they are unidentified, then ideally they should be placed in long-term storage—the mortuary beneath a hospital, for example. But the electrical power in Raqqa is limited: not enough for fridges and freezers. Perhaps later, when the city is rebuilt, there will be freezers and DNA testing. But part of putting the region back in order is removing the dead from fields and vacant lots. So the men resort to the preservation powers of the earth: Unidentified corpses get reburied in newer and more formal cemeteries outside the city as quickly as possible. They hope for possible identification later. 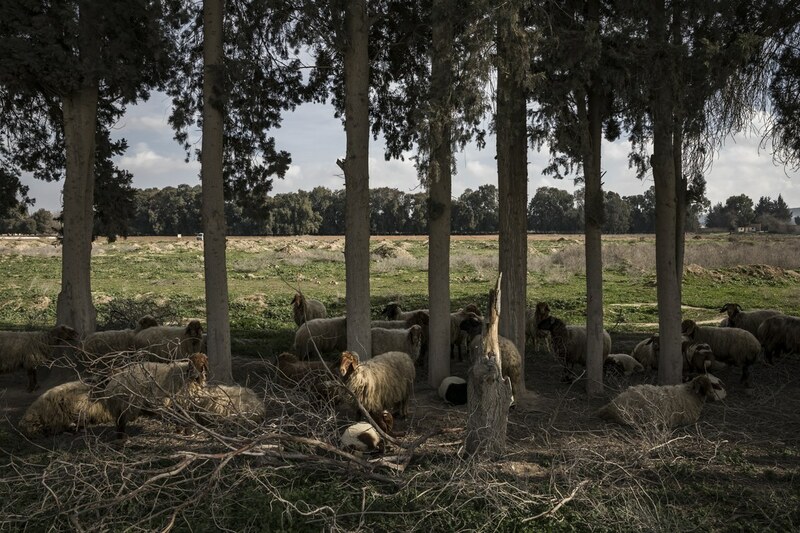 ACROSS THE GLOBE, conflict and mass graves are inseparable. On a practical level, they are an efficient way to clean up after a battle; they are also a form of disrespect and often a sign that ethnic cleansing has occurred. The international procedures for investigating such graves are well known, and the body pullers have been trained in how to log and analyze them. Start with personal protective gear—boots, an apron, and a face mask to protect from infectious diseases or hazardous gases like ammonia. Forensic experts may not be readily available, so first responders take photos. The photographs are meant to aid in identification later and should include separate pictures of the entire body, the whole face, distinguishing features and clothing, and a measuring stick for scale. Documenting in both pictures and words increases chances of identification in the future, when local hospitals or international aid organizations can facilitate DNA testing. As a booklet prepared in part by the International Federation of Red Cross and Red Crescent Societies, titled “Management of Dead Bodies After Disasters,” says: “While realizing that often it will be difficult, every effort should be made to do this before the onset of decomposition.” The booklets include pictures of actors lying next to white and black rulers. Psychological support workers should also be available to support the body pullers. But the Raqqa team cannot do any of this. They have little funding and few tools. They have no DNA-processing equipment. They have no camera. The decay further complicates the task. Their only tools of identification are those that are most universal—sight and a blind faith that all burials should be, if not monumental, at least sufficient. The first thing they have to do is locate the graves. Perhaps they have heard of them through word of mouth. The team also uses Google Maps or Google Earth and satellite images to begin to map potential locations. From above, it is easy to spot the graves: They appear in updated satellite images as rows of upturned dirt in local fields and in vacant lots across the city, like sutures across the landscape. Once an area is marked as a potential site, the teams use Facebook and WhatsApp to crowdsource more information. They post messages saying they have “opened” (the term of choice) a new mass grave and give its location. As the team starts to dig the bodies free, information from families—what jewelry their missing relative may have worn, whether they had a gold tooth, what shoes they wore when last seen alive—arrives haphazardly. Families contact team members on Facebook or visit the Raqqa Civil Council offices overlooking the banks of the Euphrates. The tips are routed to office managers, who try to match identifying information to a growing database compiled by the team as they work to capture small details—a wristwatch, a bucked tooth—in notebooks they carry with them. Today, in this field about five miles from the center of the city, the team has pickaxes and shovels, face masks and gloves. Mohammad carries a ledger, and another worker, Mahmoud Jassim, carries a series of forms. 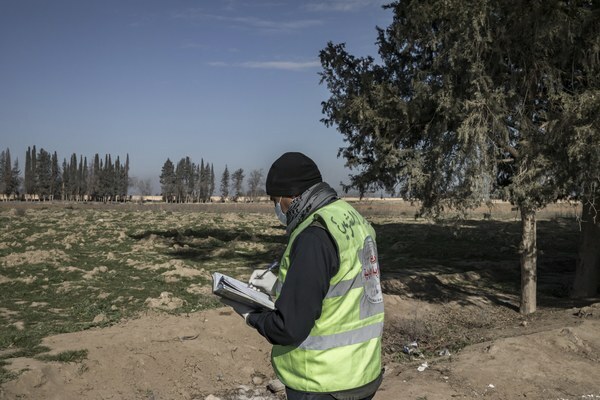 Everything the team sees goes into these notes, which go back to the Raqqa Civil Council, which digitizes them and keeps them for when families come. The body bag crinkles like a bag of chips. A zipper parts the bag into halves to reveal a mass of clothing and blankets and matted hair. I smell nothing. The men do not recoil. They reach into the extinguished tangle, four hands against the mingled bones. They run their hands through the knots of hair to find the skull. The skull is in two parts: the mandible and everything else. The teeth are clean and white with a few metal filings. The men toss the skull parts and the jaw back into the bag. They begin to root around, and Jassim draws out a piece of clothing. He cradles it to inspect the tag. “And wearing a bra,” Jassim says. The aba may suggest that the woman was a member of ISIS, but ISIS had forced the citizens of the cities it captured to wear black Islamic clothes. Everyone was dressed the same. “She might not necessarily be ISIS,” Mohammad says. Mohammad stands over the bag and watches the men zip it shut. Someone may contact the city in search of a woman wearing an aba made in Turkey, who wore a black bra, a woman with cavities. Later today, the men will put the bag, along with the others, on the back of a flatbed truck and take it to a new burial site, far from the city. The team then become grave diggers. For now, Mohammad steps over to the next body and watches over the top of his date planner while the men below unzip the bag, the 16th of the day. International organizations laud their work even as their funding runs low. 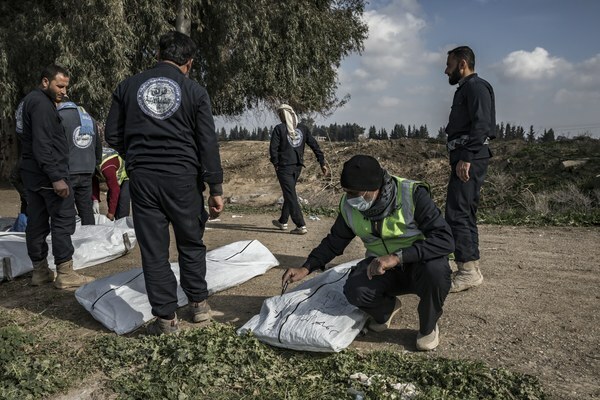 Raqqa leaders are seeking further financing from the international community and aid organizations to help with the removal and relocation of the human remains, but the work of the body pullers remains an unacknowledged aspect of reconstruction. “It has become normal for me,” Mohammad says, “as if I am dealing with living people. We pray for all of them because it is demanded by Sharia law, even if they were an ISIS fighter. After all, they are all human beings. It is up to God to judge them.” He remembers the first time he confronted human remains. It was in a field like this, equally quiet and peaceful and green. Seeing the remains then was difficult and suffocating, to think of what had happened to them that led them to their grave. He felt alone, like he was standing in a forest of ghosts. 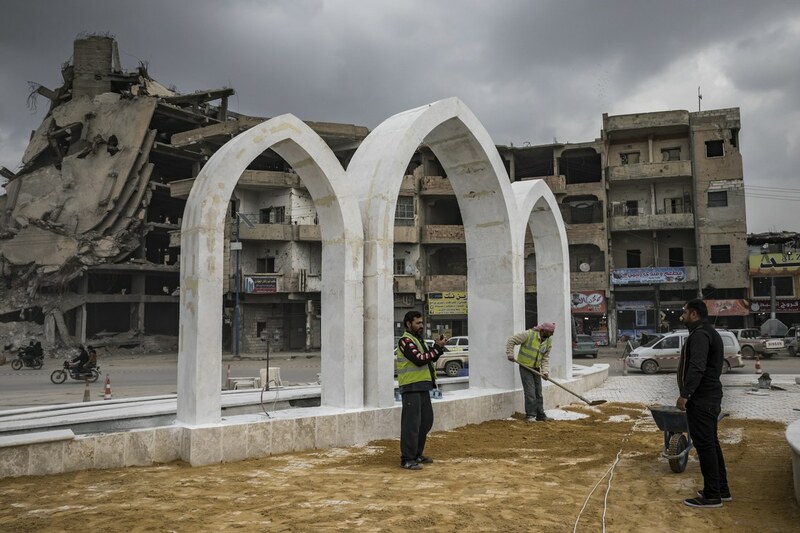 IT IS NOT normal for any city to experience occupation by a hostile, radical force, and the city of Raqqa has dissolved into a ghoulish, ashy silhouette. Roads into the city are lined with warning signs alerting travelers to booby traps and unexploded ordnance that encircles much of the city. Blue triangles mark buildings with the word “clear” written in English and Arabic. Building facades hang loose on thin strips of rebar. Many apartment buildings look almost eaten—like a giant has bitten corners from rooftops as if they were candy bars. Rubble roadblocks direct traffic around troubled neighborhoods. It is like navigating a carcass. Others knew simply because stories travel through war zones like a ripple through water: One man’s family was massacred by an ISIS fighter from China; another man was killed by a coalition air strike—his rigor mortised hands breached the rubble and friends pulled him out. Since liberation, residents have been divided over the air strikes. Some say the strikes were necessary to defeat ISIS. Others demand the coalition be held accountable for the many civilian deaths, and those deaths are likely to give rise to greater radicalization in the years ahead. 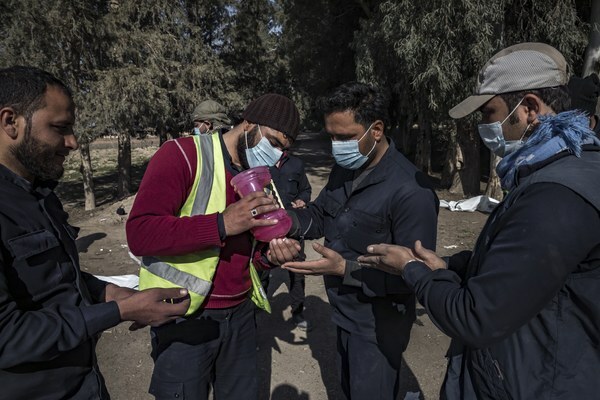 (In January, the coalition claimed responsibility for 51 deaths, bringing the total to at least 1,190 civilians since August 2014—but residents say it is much higher.) Meanwhile, residents are anxious to get their loved ones reburied properly so they can focus on rebuilding their damaged buildings. In the field, the men set to work again. If one is to rest in peace, it cannot be where one died. “Easy, easy, easy,” says one gaunt but chipper body puller. The men work their shovel blades swiftly. The men believe ISIS buried respected fighters and believers here because they note more care and regard for the stones that shape the graves. Others are less tended. I am told the graves in this field contain civilians killed by air strikes, ISIS fighters, and civilians who were executed. Another man lifts a small body wrapped in what appears to be a silk cloth out of the shallow hole. He places the weighted sheet next to the pit. Then, shortly after, another. “Both of them are children,” he says. Jassim walks a few steps down the road. In many ways, the remains of a body weigh more than when the person was alive. Jassim answers his cell phone. “His age is 6,” one man says. “And this one is a newborn,” Mohammad says. “His age is one week,” Jassim says, filling out a form. Their body bags are marked by numbers. Mohammad marks the numbers in his book, while Jassim jots the number onto his own separate sheet. A MAN HAS arrived on the back of a motorcycle, and he identifies himself as Ahmad al-Ali, a member of the Raqqa Civil Council reconstruction committee. He is voluble and emotive. He rallies the men, who gather around to discuss the job and how it is going elsewhere in the city. One of the body pullers offers to show the bodies of the newfound babies to al-Ali. “I don’t want to see them,” al-Ali says. “Children cannot come here again,” al-Ali says. But in an adjacent field a family is having what looks like a picnic. “That’s because you’re from Lebanon,” Mohammad jokes, playing on a regional belief that the Lebanese are heartless. The group of body pullers laughs with him. “No, actually,” al-Ali continues, “but because they are ISIS. May God have no mercy on them. May God have no mercy on them. It is right he is dead,” he says and points back to the line of white body bags, where the remains of a male rest among the women and children. Behind the group, farmers till the field from atop large tractors. One tractor is driven by a man who goes by Khaled. He is wearing a blue shirt and pants, much like the body pullers. He puts the tractor in park and alights. He scrambles back atop his tractor and pushes the gear into drive. The mammoth wheel turns and flattens the ground underneath. He plans to get to the other field once the bodies are removed and relocated. He will give that field the same attention and care, and new life will have a chance to grow.